A host of Italian politicians and businessmen became on Saturday the first passengers of the newly launched high-speed Milan - Bologna line dubbed Frecciarossa (red arrow). The inaugural crowd (which consisted, as would be expected, almost entirely of middle-aged men in suits) talked cheerfully to journalists and didn’t even try to contain their excitement. “The country’s longest subway line” was just one hyperbole coined during the amicable chatter. One can easily understand the reasons for their enthusiasm. After 99 months of work and almost 7 billion euros of investments, the high-speed Milan - Bologna line is operational and they are probably going to be its most loyal customers. 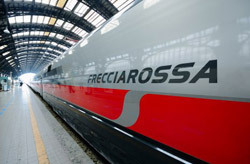 The new line promises to radically improve travel times between Italy’s industrial centers..
With Frecciarossa, a trip between Milan and Bologna, during which the train will accelerate to 300 km/hour (although only 185 km/hour on average), will now only take about an hour (65 minutes). A link to Rome (Bologna-Rome) is currently in the works. For now, that leg of the route is still running at lower speeds and the total time needed to travel between Milan and Bologna non-stop is about 3 hours and 30 minutes. Once the Bologna-Rome link is operational, however (current estimate: 2010), the two capitals - the political and the economic - will be linked with a train line that will allow for travel times just under 3 hours. P.S. All that is good and well until one starts reading the follow-up reports. Since Sunday, thousands of Lombardians encountered delays while the quirks of running the new service alongside the older link were being worked out. Cancellations were rampant, as were delays. Monday commute was already dubbed the “Black Monday” (il lunedì nero) in Lombardia. Some of the delays may not even necessarily be linked directly to the new launch of the new line - other things, like technical problems, winter schedules coming into effect and mass protests going on - all at the same time were named as reasons, but the currently- discussed and very realistic possibility of a near-complete shutdown of the rail link near Milan, with thousands of daily passengers affected, shows that in Italy, much like everywhere else, the triumph of big public projects is never too far from being turned into a complete logistical disaster.